Just Romantic Suspense: Loser or Redeemable Hero? You Decide! Loser or Redeemable Hero? You Decide! Congratulations to "Colleen", the winner of Gail's giveaway. Thank you to all who participated! How damaged can a character be and still come across as heroic? That’s the question I grappled with when I wrote A KISS TO DIE FOR, the second installment in my Buried Secrets trilogy. I’ve always been attracted to loner heroes, those wounded, gunslinger-type men who ride into town and save the day, despite their reluctance and flaws. And I’ve written quite a few heroes that fit that mold. But how much is too much? At what point does a damaged hero veer into loser category and become someone we can’t cheer on? In case you don’t know, the Buried Secrets trilogy follows the fate of three women, three former teen runaways who met on Baltimore’s dangerous streets, banded together for protection, and became close friends. Then one day, they witnessed a murder committed by a dangerous man, putting them on the run again. Fifteen years later, Brynn Elliot, the heroine of FATAL EXPOSURE (June 2013), is a renowned photojournalist who specializes in chronicling the dangers of street life. Haley Barnes, the heroine of my current story, A KISS TO DIE FOR (August 2013), runs a shelter for pregnant teens. Nadine Seymour, the protagonist of SEDUCED BY HIS TARGET (December 2013), is a plastic surgeon who does pro bono work on battered women. They all live under the radar until a chance photo in a newspaper exposes Brynn’s identity, blowing the lid on their secretive past -- and putting the killer hard on their heels again. A KISS TO DIE FOR begins when a gang (hired by the killer) attacks Haley and a pregnant teen she’s trying to protect. Help comes from an unlikely source -- the homeless man who is camping out in the row house down the street. But Sullivan Turner is nobody’s hero. He is a wounded ex-soldier suffering from PTSD, his life shadowed by the memories of the fallen comrades he put in harm’s way -- fairly standard fare for a hero in romantic suspense. But he has another problem, one that makes him wholly unsuitable to come to Haley’s aid. He’s an alcoholic. He’s not just a heavy drinker, but an addict, suffering from the shakes and other withdrawal symptoms when he tries to stop. Add in the flashbacks caused by PTSD, and you can see that he is a mess. I know he doesn’t sound precisely heroic. And yet, as I wrote A KISS TO DIE FOR, I found myself caring more and more about this damaged man. His problems became real; his disillusionment and loss of idealism about himself heartrending. In the end, Sully became one of my favorite heroes ever -- and brought me to tears multiple times. I don’t know what readers will think about him. Writing a man that flawed comes with a risk. Will they see him as the hero that I did, or shrug him off as a loser not worthy of the role? So what do you think? Is there a line a hero can’t cross before he becomes too damaged for you to care? Would you read a story about an alcoholic man? I’d love to know! 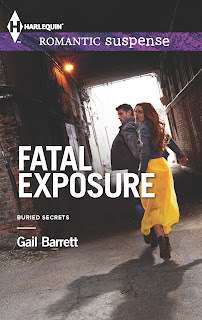 Leave a comment to be eligible for a copy of Fatal Exposure, the first book in the Buried Secrets trilogy in a format of your choice. Gail Barrett is the award-winning author of thirteen romantic suspense novels. A former RITA® and Daphne finalist, Gail has received the Book Buyer’s Best Award, the Holt Medallion, the Booksellers Best, and the National Readers’ Choice Award, along with Romance Writers of America’s prestigious Golden Heart. She currently lives in Western Maryland. When not writing novels, she teaches classes at the community college and blogs about her pathetic attempts to get in shape. She loves hearing from her readers, and can be reached at gail@gailbarrett.com. Giveaway ends 11:59pm EST Aug. 13th. Please supply your email in the post. You may use spaces or full text for security. (ex. jsmith at gmail dot com) If you do not wish to supply your email, or have trouble posting, please email maureen@JustRomanticSuspense.com with a subject title of JRS GIVEAWAY to be entered in the current giveaway. Print book eligible for US residents. Digital format outside the US. I think as long as our heroes want to be better and work to do the right thing, they will always be heroes. First and foremost they are people with flaws. We all have them. Sully sounds so tortured. Let's face it...tortured heroes make the best heroes! The book sounds great! Congrats! Thank you, Dee!!! He is definitely tortured, and it's awfully hard to sugar-coat an addiction. I hope readers will give him enough of a chance to see his growth at the end of the story, but they might be too put off. I love damaged heroes. And this post couldn't be more timely for where I am in revising my romantic suspense and I only hope my character can be flawed but heroic and that readers will embrace him as well. I will be checking out your trilogy. Your hero sounds wonderfully gritty and real - and those are the characters I enjoy reading and writing (if I have the courage to go there:). Thanks for the post! Denny, I totally understand. I was really taken aback when Romantic Times said he was "messed up, guilt-ridden, and an alcoholic." All that is true, but it makes him sound like such a loser, not a hero I would want to read about. And yet, even my editor thought he was one of the best heroes I'd ever written. So it was definitely a gamble, but I have no regrets. Still, it is a risk!!!! Kris, I really appreciate that. I'd love to know what you think when you're done reading it. I think a lot of readers are tired of the typical heroes and are willing to take a chance on one that is different. At least I hope so! I do like damged characters and I would read a story about an alcoholic. Tammy, I definitely have a soft spot for damaged heroes, too. The self-exiled loner gets to me every time:)))) Sully is more tortured than most, but I found him even more compelling because his problems were more severe. I love flawed heroes... the world is not perfect and the characters can show that they also are not. I have read books where the hero has issues whether he was a drunk, has PTSD, etc... it is how they work passed the things in their lives... their journey to a better them that I like. A flawed hero struggling with a personal battle while fighting for the heroine sounds like a great story. I can't wait to read it! Thanks, C.J!!! He is not in denial. He resists helping her because he knows that he is too damaged to protect her. But in the end, he is too heroic not to come to her aid. So not only does he end up helping her, but she gives him the final bit of motivation he needs to help himself. I found myself really rooting for him. You could be writing about my husband. When we met he was an alcoholic, living with sister and brother in law, still suffering from things he had seen/done in Vietnam. I don't know why I could see through all of that, but I'm glad I did. We've been together 20 years, married 17 years and after a few false starts he has been sober for 16 years. While the early years weren't easy, he has become my hero. Wow, Julie. What an inspirational story!!! I'm so glad you were able to see past the wounds to the great man underneath!!! And that is extremely impressive that he has stayed sober for so long. I think that's what got me the most about Sully, the enormous sacrifices he made for our country, and how he went from being an idealistic young man to one who lost his illusions. People who go to war see such awful things and their lives are never the same. It's awfully hard not to lose your heart to guy like that! And I will always, always be so grateful and indebted to them for what they've done. I'm old enough to remember the Vietnam war, the draft, and how wounded those guys were when they came home. Thank you Gail. I've heard people say things along the lines of it (Vietnam) was so long ago.... how long are they going to use that excuse for bad behavior and choices? My response? You get to wake up from your nightmares. Wartime vets will live their nightmares, asleep and awake, always. Between your book and people like my hubby maybe we can show others that these men (& women) are worth taking a chance on. What a beautiful sentiment, Julie!!!! Please tell your husband that his sacrifices are NOT forgotten, even though it may seem like in given our society today. Those Vietnam vets are especially heroic since they fought an unpopular war not of their doing, and at a time when our country was in so much upheaval. They went through hell in Vietnam and came back to a society that didn't seem to care. That is a national shame. No worries, BN! I would NEVER have any hero I wrote do that. That would definitely make him a loser in my eyes, too!!! I think that's the key. No matter how flawed, you need to care about them. When he does the whole "I will make decisions for you b/c I *know* better than you!" that's kinda psychotic to me, not alpha. Oh, and cheating. Thanks for sharing! I hate that, Erin. Both situations are bad. I'd have my heroine running out of there pronto! I love flawed/damaged heroes, crave their stories. The stories cross that imaginary line for me when their behavior toward the heroine is cruel for the sake of being mean. That's when I can't get back to empathy. Cheating is also a deal breaker, so much so that I'm gone permanently. I'd never have an issue reading about a hero overcoming alcoholism, to answer your question. That's redemptive. Jonetta, that's why I didn't romances back in the 70's or early 80's. The heroes were too mean. I won't even read Harlequin Presents today, even though they aren't all like that. I like strong heroes, but not arrogant or cruel ones. I also think it's a dangerous message for women to think they can change a guy like that. I guess that's where fantasy ends for me, too!!! And thank goodness for those changes, right? I've picked up a couple of older stories by mistake and have been amazed at the contrast. We have definitely come a long way!!! A Kiss to Die For has the most unlikely hero. This would be a very good book to read. A homeless, alcoholic, veteran who needs to fight his demons and needs a something worth fighting for. I can't wait to read this book. Thank you so much, Kai. I would love to hear what you think!!!! Hi. I don't don't like heroes who cheat and have the attitude that they are better than everyone else, including the heroine. Thank you for the giveaway. The trilogy sounds great! I agree, Jaclyn. I don't think I've read any stories about cheating heroes. Honestly, I would put that book right down if I came across a hero like that. And I can't read stories about arrogant heroes, either. I just don't see the appeal of them. That's why I never went for the really "alpha" types. There is a difference between strong and arrogant. LS, I agree completely about sports stars and movie stars. I can't even apply the word "hero" to them. So they can throw a ball well or pretend to be someone else. Why is that more heroic than a fire fighter who risks his life to save people? Our society's values are so skewed! WOW, Gail, that's really breaking 'flawed' ground. I guess if he can still reach deep down and behave heroically you'll have a blockbuster on your hands. Usually with an addiction like alcohol it becomes their world and their behavior alters to feed it. Impressed with your creativity, looking forward to reading it! You're absolutely right, Sarah. I guess that's the problem with fiction, particularly romantic fiction. We want to reflect reality, but in a lot of cases, reality is too harsh to be romanticized. Sometimes chemical addiction alters a person's brain making it nearly impossible to stay sober. Still, people do overcome addictions with enough motivation, and assuming they aren't too far gone. Hopefully I've made Sully plausible enough!!! Broken heros, as many have mentioned above, are the ones readers adore. These characters have to fight through the muck of their personal demons and damages to still find worth in themselves and others that I find fascinating. Their act of overcoming these impediments is heroic in and of itself. For me, I lose interest if the hero/heroine whines too much. We expect some sort of inner discussion of "why me?" etc., but too much of it leads me to believe that a character is stuck in neutral, unwilling to get past themselves and move forward, to improve, to conquer. There are a few (popular) characters out there that I lost interest in for that very reason. Thank you for posing such a thoughtful question! That's a great point, Maria. I agree that the inner struggle of the characters is far more satisfying than the outer ones. I love reading a story with that kind of emotional depth. I also agree that too much introspection can make the character seem self-absorbed and unappealing. It's definitely something to keep in mind!! If a man has been brought up from childhood to love and protect others, I believe that inherent drive will continue no matter what his current emotional state is, especially during a crisis. Drugs may affect his physical responses, yes, but the mind is capable of some amazing things, and the heart even more. Excellent insight, Linda! Sully fits that characterization exactly. There is a scene where his mother talks about how he was as a child, always sticking up for the underdogs. I cry every time I read it:)))) Thanks for stopping by! There are plenty of lines a man can cross that make me feel he can never be a hero (in fact, I *just* wrote a post about it at http://www.laurakcurtis.com/blog/2013/08/ticas-tropes-i-cannot-abide-1-alphaholes-abusers-sympathetic-pasts/ ), but I don't ever consider *damage* to be one of those lines. People who hurt others can be irredeemable. People who hurt themselves more often inspire--at least in me--the desire to heal. I loved your blog post, by the way! That's a wonderful way to put it, Laura. I feel exactly the same way!!! If the hero is cruel to the heroine and she doesn't walk away, I instantly lose sympathy for them both.